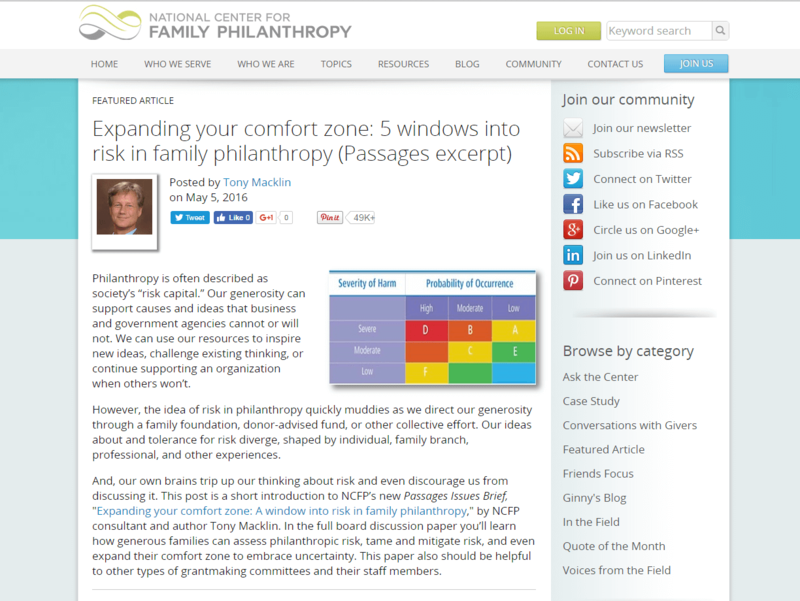 Risk is a fundamental component of philanthropists' success. Philanthropists invest money to achieve certain specified outcomes, and like any investment, that transaction is governed by the interplay between risk and return. While philanthropy has taken strides in recent years to build out the monitoring and evaluation systems necessary to measure and determine our return—described as impact—we routinely ignore the risk half of the equation. To address this gap, Open Road Alliance, Rockefeller Foundation, and Arabella Advisors convened the Commons— a diverse task force that represents all facets of philanthropy, including foundations, nonprofits, impact service providers, nonprofit attorneys, wealth advisors, and philanthropic associations. The Commons confirmed that the lack of open conversation about potential risk is a major problem for the field, and developed a first set of user-friendly tools to help funders implement better risk practices. 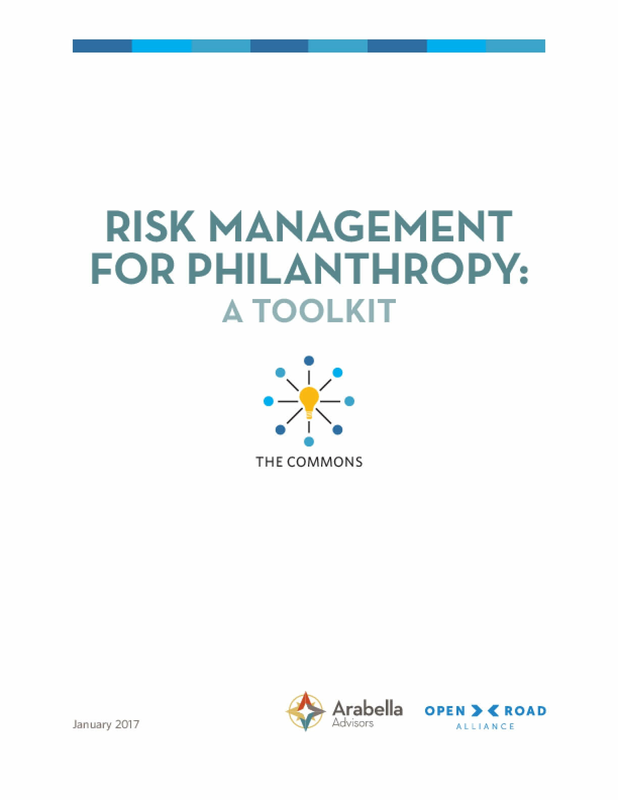 These tools are broadly applicable across the philanthropic sector and can help all types of funders, from those first beginning to discuss risk internally to those who are evaluating the effectiveness of their risk management strategies after several years. 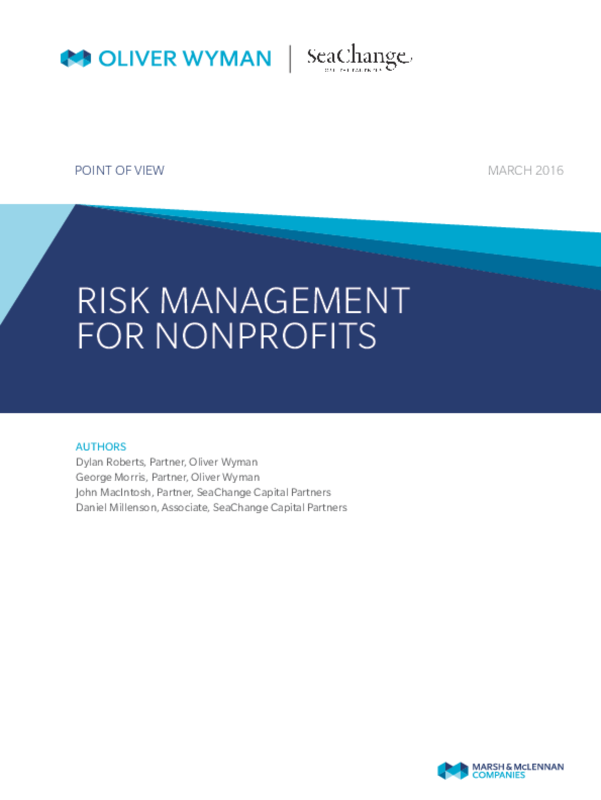 With this toolkit, we seek to encourage funders to establish a deliberate risk profile and integrate risk management into their philanthropic practice. Social impact investing has gained a lot of traction in recent years, with a sustainable global investment market estimated to exceed $13 trillion in 2014. And the market's participants vary widely. Not surprisingly, they include investment giants such as Goldman Sachs, JP Morgan, and BlackRock. 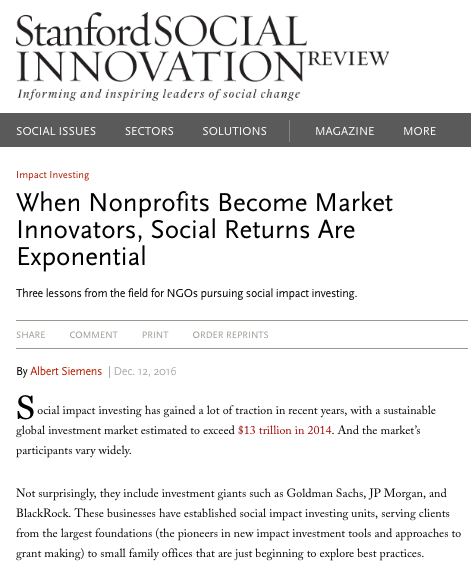 These businesses have established social impact investing units, serving clients from the largest foundations (the pioneers in new impact investment tools and approaches to grant making) to small family offices that are just beginning to explore best practices. But NGOs and other nonprofits are also fueling the trend, with notable success. Many have provided micro loans and multiple other forms of capital to small or startup entrepreneurs, and some have supported new enterprises with capacity building, talent recruitment, links to private investors, and access to markets. "Data at scale" -- digital information collected, stored and used in ways that are newly feasible -- opens new avenues for philanthropic investment. At the same time, projects that leverage data at scale create new risks that are not addressed by existing regulatory, legal and best practice frameworks. 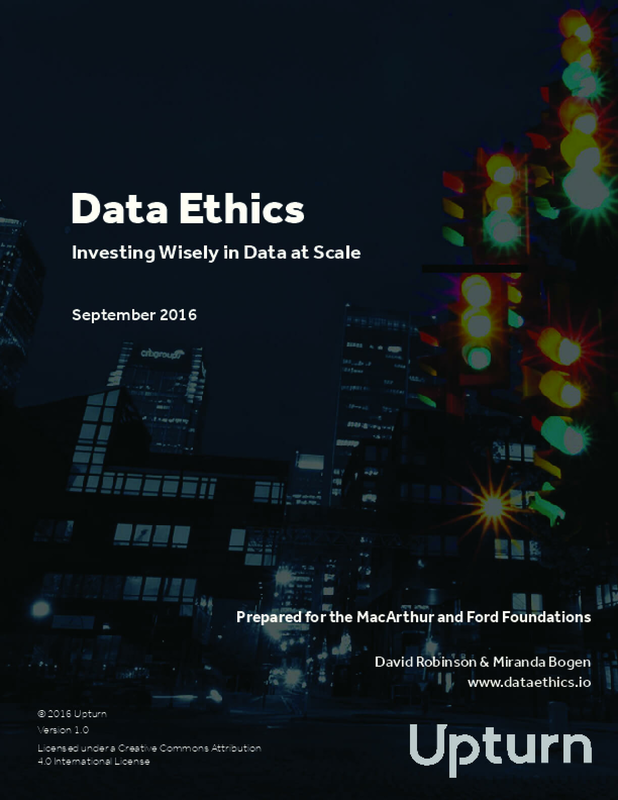 Data-oriented projects funded by major foundations are a natural proving ground for the ethical principles and controls that should guide the ethical treatment of data in the social sector and beyond. This project is an initial effort to map the ways that data at scale may pose risks to philanthropic priorities and beneficiaries, for grantmakers at major foundations, and draws from desk research and unstructured interviews with key individuals involved in the grantmaking enterprise at major U.S. foundations. The resulting report was prepared at the joint request of the MacArthur and Ford Foundations. 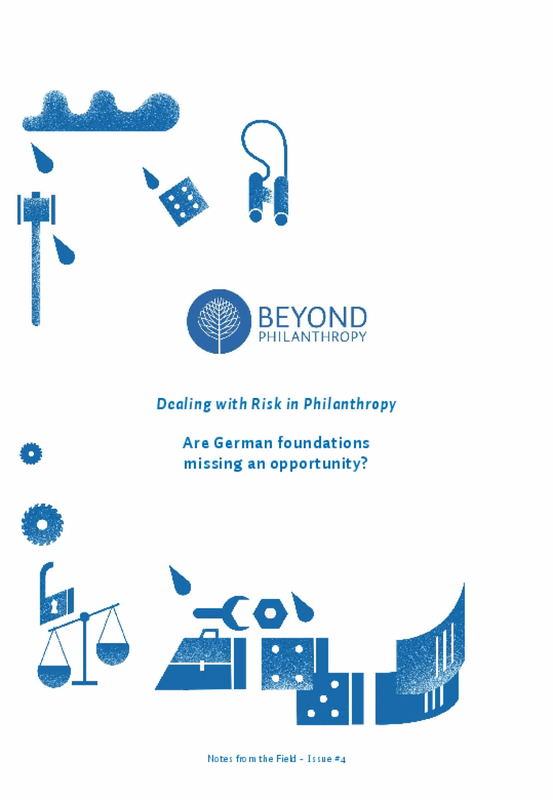 Dealing with Risk in Philanthropy: Are German Foundations Missing an Opportunity? Until now, risk is not a very prominent topic in the German foundation sector. This is surprising since foundations, due to their unique position in society, have extraordinary risk taking abilities. The latest issue of "Notes from the Field" deals with four different foundation risks: reputational, legal, operational and opportunity risk. The presented results are based on a research conducted by Timothy Hobden who encourages foundations to be more open to risky bets and strategic risk management in order to find innovative solutions for complex social problems. Many of us in family philanthropy are driven by a grand vision of a better world. We are motivated by bold ideas, and finding ways to use our philanthropy to make a difference and leave a lasting impact.And, at the same time, we are too often hamstrung by a fear of failure. While keenly aware of the hard work that went into earning the money we are giving away, we may feel an obligation to ensuring that the funds are allocated responsibly.We are also often wary of taking the same risks in our philanthropy that we would take in business. Investors typically balance their portfolios, making sure there is a balance of both higher- and lower-risk investments. The high-risk investments are more likely to fail, but, if they pay off, they usually have a higher return than the more dependable, lower-risk investments. 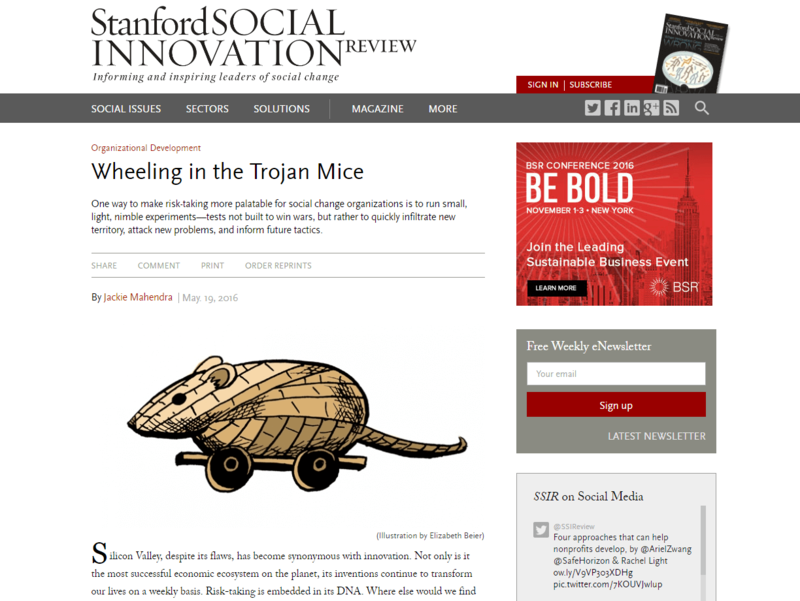 One way to make risk-taking more palatable for social change organizations is to run small, light, nimble experiments – tests not built to win wars, but rather to quickly infiltrate new territory, attack new problems, and inform future tactics.Unless we're willing to experiment, we can't expect big breakthroughs. One way to do that – to make risk more approachable – is to run small tests. 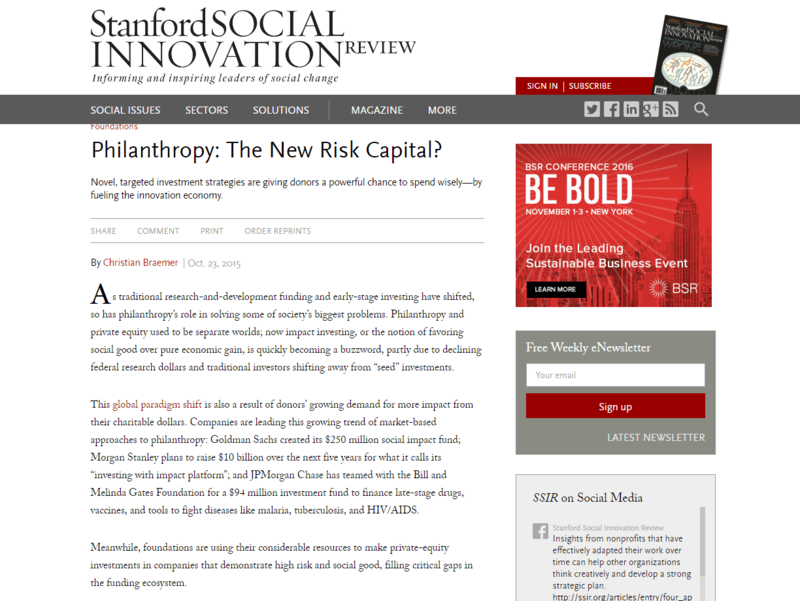 Philanthropy is often described as society's "risk capital." Our generosity can support causes and ideas that business and government agencies cannot or will not. We can use our resources to inspire new ideas, challenge existing thinking, or continue supporting an organization when others won't. 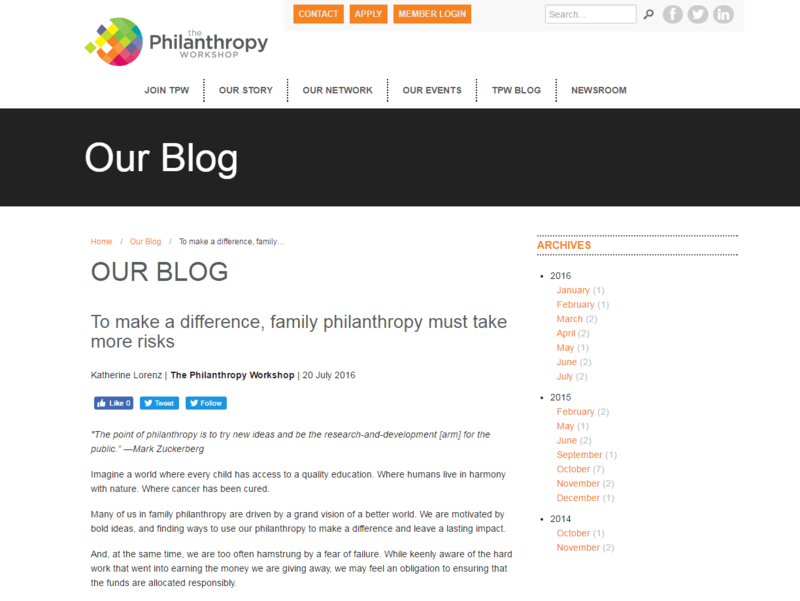 However, the idea of risk in philanthropy quickly muddies as we direct our generosity through a family foundation, donor-advised fund, or other collective effort. Our ideas about and tolerance for risk diverge, shaped by individual, family branch, professional, and other experiences. 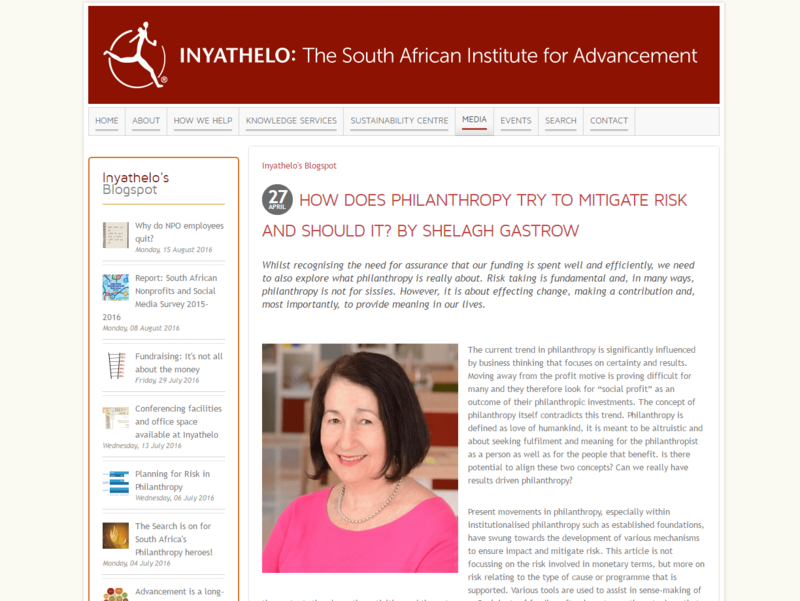 How Does Philanthropy Try to Mitigate Risk and Should It? Whilst recognising the need for assurance that our funding is spent well and efficiently, we need to also explore what philanthropy is really about. 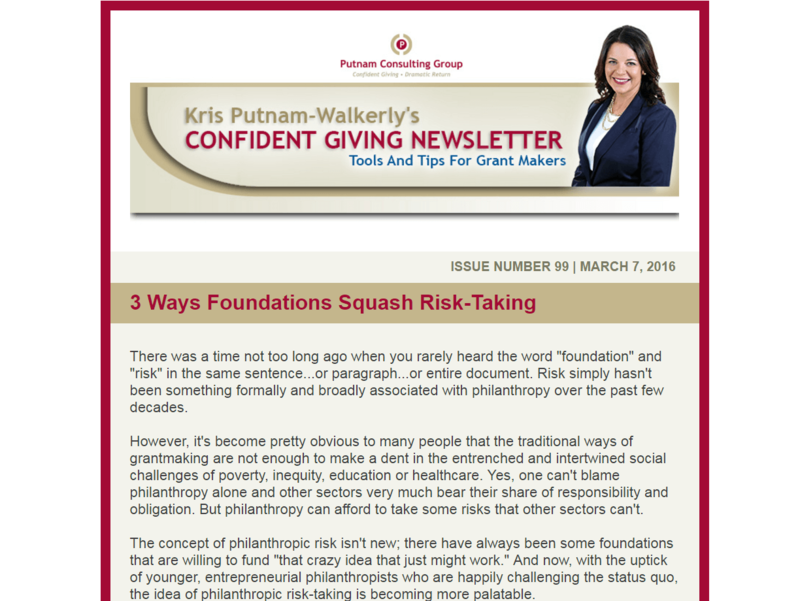 Risk taking is fundamental and, in many ways, philanthropy is not for sissies. However, it is about effecting change, making a contribution and, most importantly, to provide meaning in our lives. Our research, based on the first comprehensive financial analysis of New York's nonprofit sector, found that 10% of the city's nonprofits were insolvent and 40% had virtually no cash reserves. Less than 30% were financially strong. If anything, things are getting harder, given market volatility, the move to value-based payments in health care, and increased costs for real estate and labor. Fortunately, we also discovered that nonprofits can take a few concrete steps to reduce their risk of failure and sustain vital programs: Make risk management an explicit responsibility of the audit and/or finance committee.Develop a risk-tolerance statement, indicating the limits for risk-taking and the willingness to trade short-term impact for longer-term sustainability.Keep a running list of major risks and the likelihood and expected loss for each.Put in place plans for how to maintain service in the event of a financial disaster, or even a "living will" that specifies how programs will be transferred to other providers (or wound down in an orderly fashion) in the event that recovery is not possible.Brief trustees regularly about longer-term trends in the operating environment.Periodically explore the potential benefits of various forms of organizational redesign, such as mergers, acquisitions, joint ventures, partnerships, outsourcing, managed dissolutions, and divestments.Compare financial performance to peers on an annual basis.Develop explicit targets for operating results (margins, months of cash, etc.) and contingency plans if minimum targets are not met.Redouble efforts to build and safeguard a financial cushion or "rainy-day fund," even if doing so forces consideration of difficult programmatic trade-offs.Doing any of these will depend on a functioning partnership between capable management and a critical mass of experienced, educated and engaged board members. Therefore, organizations serious about risk management must work hard to recruit board members with a wide range of experience. They need to ensure ongoing education for both new and existing board members and to empower high-functioning committees. Many organizations, particularly large and complex ones, would also benefit from having an experienced nonprofit executive on their board. There was a time not too long ago when you rarely heard the word "foundation" and "risk" in the same sentence...or paragraph...or entire document. 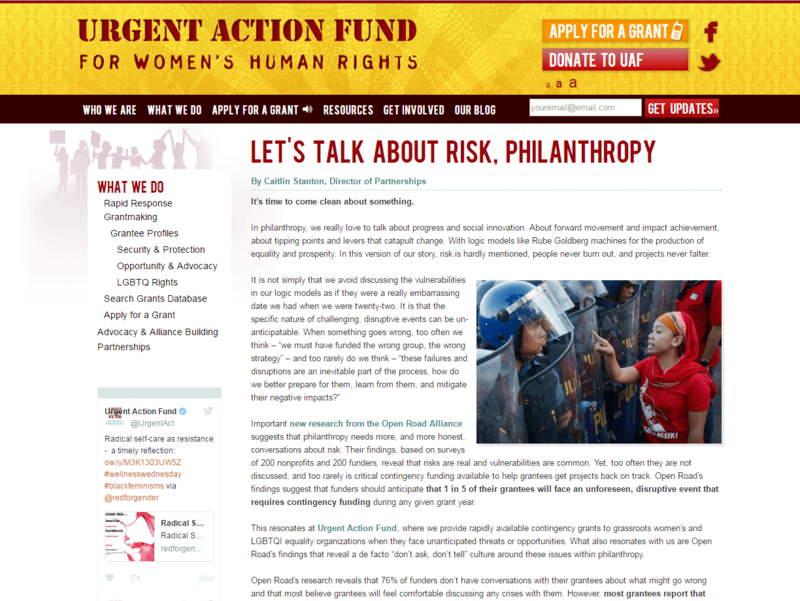 Risk simply hasn't been something formally and broadly associated with philanthropy over the past few decades.However, it's become pretty obvious to many people that the traditional ways of grantmaking are not enough to make a dent in the entrenched and intertwined social challenges of poverty, inequity, education or healthcare. 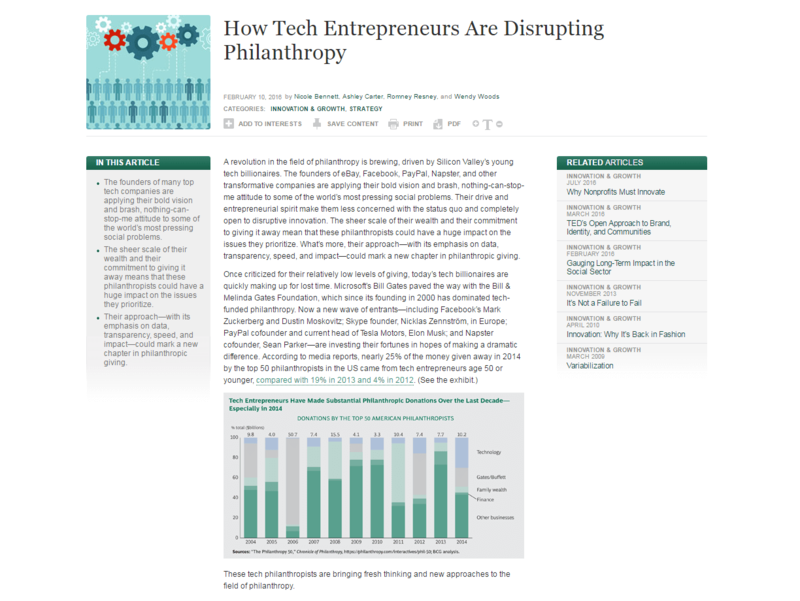 Yes, one can't blame philanthropy alone and other sectors very much bear their share of responsibility and obligation. But philanthropy can afford to take some risks that other sectors can't. A revolution in the field of philanthropy is brewing, driven by Silicon Valley's young tech billionaires. The founders of eBay, Facebook, PayPal, Napster, and other transformative companies are applying their bold vision and brash, nothing-can-stop-me attitude to some of the world's most pressing social problems. Their drive and entrepreneurial spirit make them less concerned with the status quo and completely open to disruptive innovation. The sheer scale of their wealth and their commitment to giving it away mean that these philanthropists could have a huge impact on the issues they prioritize. What's more, their approach—with its emphasis on data, transparency, speed, and impact—could mark a new chapter in philanthropic giving. 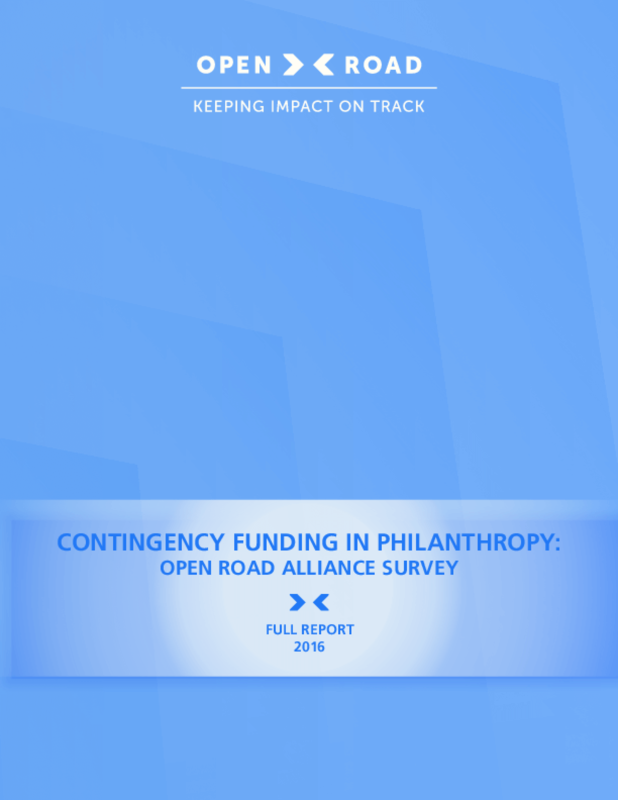 In 2015, Open Road Alliance conducted a 400-respondent survey designed to look at the frequency of need for contingency funding as reported by Funders and Grantees. The survey was designed to explore the following questions about risk and contingency funding: Frequency: How often do projects need contingency funding? Donor Response: How often are projects granted additional contingency funds? Capacity: What policies and procedures are in place to deal with contingencies? Consequences: What are the consequences of unfunded requests for the project and for the Funder-Grantee relationship? The survey data lead to five key findings: Disruptions requiring additional funds (i.e., contingency funds) are common and expected. Both Grantees and Funders report that about 1 in 5 projects require contingency funding to bring projects in on time and with full impact.It is not a common practice for Funders or Grantees to address these risks before they happen.When contingency funds are needed, most Funders do have the operational and financial capacity to respond. When asked, the majority of Funders do approve additional requests.Grantees are hesitant to communicate with Funders about potential obstacles.Funders' and Grantees' perceptions regarding the effects of their actions on each other are often misaligned. Specifically, grantees believe that asking for additional funds negatively affects the likelihood of being awarded future grants, while the vast majority of Funders claim such requests have no effect on future decision-making. Strategic planning has given us an opportunity to explore and define the role of risk in our work at the Barr Foundation. 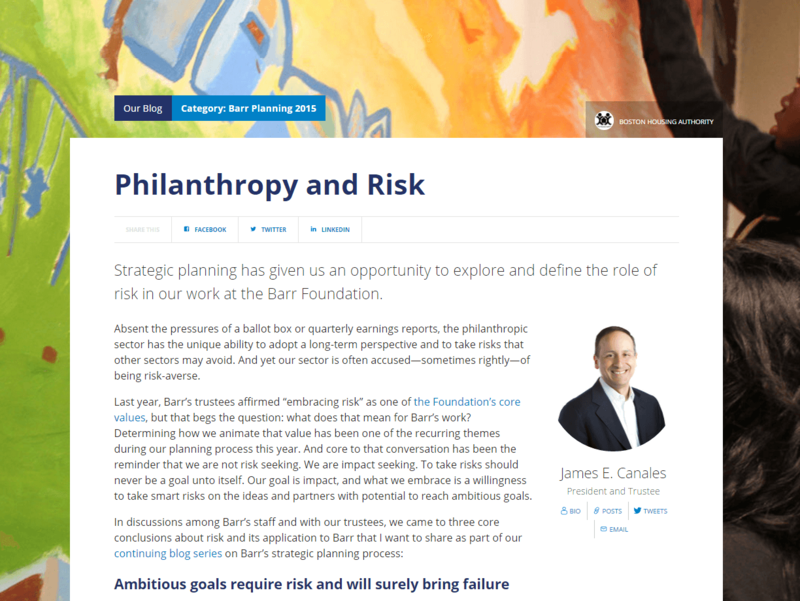 Absent the pressures of a ballot box or quarterly earnings reports, the philanthropic sector has the unique ability to adopt a long-term perspective and to take risks that other sectors may avoid. And yet our sector is often accused—sometimes rightly—of being risk-averse. Last year, Barr's trustees affirmed "embracing risk" as one of the Foundation's core values, but that begs the question: what does that mean for Barr's work? Determining how we animate that value has been one of the recurring themes during our planning process this year. And core to that conversation has been the reminder that we are not risk seeking. We are impact seeking. To take risks should never be a goal unto itself. Our goal is impact, and what we embrace is a willingness to take smart risks on the ideas and partners with potential to reach ambitious goals. 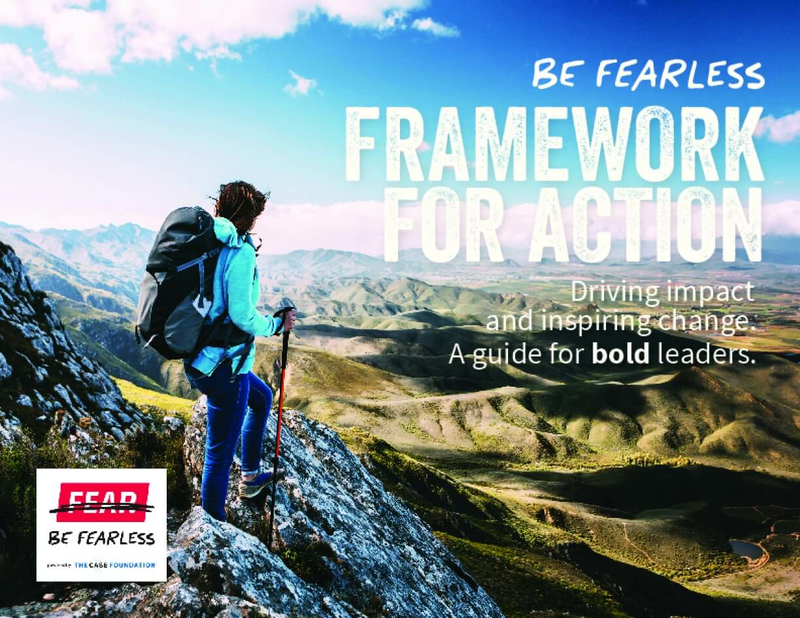 Be Fearless Framework for Action: Driving Impact and Inspiring Change. A Guide for Bold Leaders. There are three stages of fearlessness: awareness, action and institutionalization. The framework offers a range of ideas about how an organization's actions may change over time as it becomes more fearless. As traditional research-and-development funding and early-stage investing have shifted, so has philanthropy's role in solving some of society's biggest problems. Philanthropy and private equity used to be separate worlds; now impact investing, or the notion of favoring social good over pure economic gain, is quickly becoming a buzzword, partly due to declining federal research dollars and traditional investors shifting away from "seed" investments.